NEW YORK — The roller coaster ride on Wall Street resumed on Wednesday, the first trading day of the new year, as stocks plunged in the morning and then began climbing back. The Dow Jones Industrial Average dropped as much as 398 points in the first few minutes of trading after more shaky economic news from China. But it soon recovered much of those losses. At 11:30 a.m., it was down 61 points. About two-thirds of the stocks on the New York Stock Exchange were trading higher. That kind of whiplash was typical during the last three months of 2018. A Chinese government survey and one by a major business magazine showed manufacturing in China weakened in December as global and domestic demand cooled. That weighed on big exporters, with technology companies like Microsoft and industrials like Boeing taking sharp losses. Stocks are coming off their worst year in a decade. The benchmark S&P 500 fell 6 percent last year, its first substantial loss since 2008, and it has dropped more than 15 percent since late September. Many other stock indexes around the world fared even worse last year. From September through the end of December, investors became more and more worried that challenges such as U.S.-China trade tensions, rising interest rates and political uncertainty could slow the economy and company profits, and possibly tip the U.S. economy and the global one into a recession. The U.S. economy has been expanding for almost a decade, and stocks have risen steadily over that time. Many Wall Street banks are forecasting a year of modest gains for stocks because stock prices tend to follow corporate profits. But most also say that they expect these sharp reversals to continue as investors try to handicap so many unknowns. As of late morning, the S&P 500 index was down 3 points, or 0.2 percent, to 2,503, and the Dow was down 0.3 percent at 23,265. After sharp losses at the start of trading, benchmark U.S. crude jumped 3.2 percent to $46.88 per barrel in New York. Brent crude, used to price international oils, rose 5 percent to $56.49 per barrel in London. Oil prices fell sharply over the last three months of 2018 as investors reacted to the possibility of weaker demand for energy as economic growth slowed. Prices on long-term government bonds rose, a sign investors were looking for safer options. The yield on the 10-year Treasury note fell to 2.67 percent from 2.69 percent. Electric car maker Tesla sank after its fourth-quarter vehicle deliveries fell short of Wall Street projections. The company also said it is cutting the prices of its cars $2,000 to help customers handle the gradual phase-out of federal electric vehicle tax credits. The stock gave up 7.6 percent to $307.59. —The Nasdaq composite rose 9 points, or 0.1 percent, to 6,644. —The dollar fell to 109.30 yen from 109.61 yen. The euro fell to $1.1357 from $1.1445. The British pound slid to $1.2588 from $1.2752. 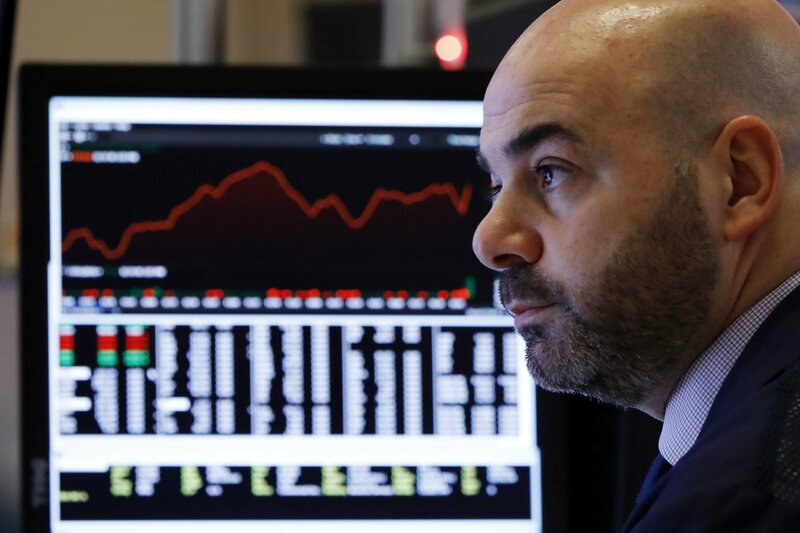 —France’s CAC 40 fell 0.7 percent and the British FTSE 100 added 0.3 percent. Germany’s DAX rose 0.5 percent. Hong Kong’s Hang Seng tumbled 2.8 percent and Seoul’s Kospi gave up 1.5 percent. Tokyo’s markets were closed.